We all love a handyman, a professional who can fix anything. And not just any handyman, we want the best handyman. When our pipes burst, we call the plumber. When our cars break down, we call the mechanic. So why would you try to make a homemade paint booth? Whenever you are dealing with highly volatile products such as paint and chemicals there is the possibility of fire or the risk of an explosion. This is why homemade paint booths are not quite the route to take. Of course they are cheaper, and that is exactly the quality you will get. Dealing with something as serious as mixing harmful chemicals, a topnotch manufactured paint booth is required to keep you safe. Homemade Booths rarely, if ever, meet NFPA 33 and OSHA codes. Many homemade paint booths have no ventilation system. A paint booth is essentially a sealed area with a powerful fan or air circulation unit installed in it. Your circulation unit should be powerful enough to circulate all the air in the room every five minutes to prevent the buildup of fumes. Both the inflow and the outflow vents should be equipped with air filters. 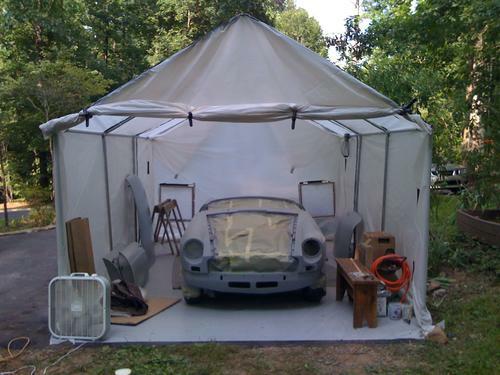 A non-ventilated paint booth may be decent for painting small objects such as a dice; however, when painting big projects like car parts, your breathing is in trouble. Manufactured paint booth systems are more pleasant, less likely to cause painting problems and a whole lot less likely to blow you to Kingdom Come! The technology is available to keep you alive. At Standard Tools, your safety is number one on our list. Our booths are quality to keep you safe and will not damage your pockets. Everyone wants to have quality and save money at the same time. Let Standard Tools do that for you. Next Next post: Are Your Filters HAZARDOUS?